Terms like ‘guerrilla-­­­­­­_____’, ‘placemakers’ and ‘sustainability’ are on an ever-growing list of buzzwords* adopted by everyone from the smallest charities to the biggest brands. Of course the problem with buzzwords is that the journey to the heights of popularity can quickly take a turn into a cul-de-sac of dilution and overuse, and these phrases risk becoming nothing more than jargon. Stories affect us all in ways facts and figures just can’t. We remember stories. We identify with the characters. Stories make us laugh and cry, and we retell them time and time again. As charities we share stories to demonstrate the difference we make and hope to trigger emotions in our supporters which encourage them to respond to a call to action, whether that be to sign a petition, make a donation or join us in our work. It’s what’s billed as The Power of Storytelling. If you’re not convinced by The Power, pick up a newspaper, open the charity appeal letter before binning it, or just Google the term; it’s definitely ‘a thing’. And it’s a thing I’m often responsible for in my work but last week I felt The Power for myself. On the face of it, it was quite unlikely that a conference on the topic of Evidence Based Policing would leave my cheeks wet with tears but, y’know, strange things can happen in Canterbury on a Thursday afternoon. The conference was pretty niche in terms of a wider audience but to provide you with a degree of context the focus was on research, research methodology, the resulting statistics and how they can be used to create change. 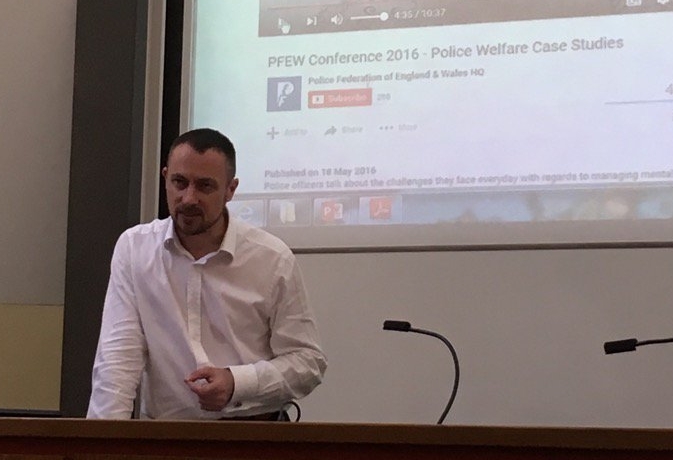 The theme was ‘Policing Under Stress’ and alongside the academics and practitioners listed on the agenda was a serving police officer, Jon. His input had the very simple title ‘I am Evidence’, the premise being was that to truly understand a situation you have to get behind the stats and speak to the people involved. What unfolded reinforced for me the importance of telling human stories. 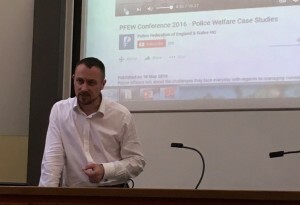 Having been a police officer for twenty years Jon doubtless had many incidents to share but chose three to highlight the impact his police work had had on his own mental health. He talked of his mind racing with possible outcomes as he faced a gunman head on, the sheer desperation of dealing with the sudden and distressing death of a toddler and the overwhelming sense of shame he felt when, as a young officer, he had been called to assist social services in removing extremely vulnerable children from their family home. Jon became visibly upset and the room fell silent, which only served to amplify the sound of his voice catching in his throat as he explained how – despite knowing their removal was the right thing – he would always remember their distress. Jon regained his composure as he went on to speak candidly about the bouts of depression he had suffered. He explained that while his sickness record (the statistics) showed he hadn’t taken time off work, they masked two of the biggest emotional and physical crashes of his career, which his supervisors would only have known about had he felt willing or able to share the information with them (the human story). No doubt Jon had relived these moments a hundred times but his recollections (it feels insincere to call them ‘stories’) had an impact on him that quickly spread through the room, and I’m not just talking about the audience feeling for him as he wiped tears from his face. Keeping one eye on the conference Twitter feed, it seemed Jon’s talk had gone well beyond sympathy to genuine empathy as people remarked on how similar incidents had affected them or those they know personally (you can read a collection of the tweets here). At this juncture it’s worth explaining that unless you, or someone close to you has been a police officer, it’s really hard to grasp the impact of ‘the job’. In fact, it’s not a job, it is a way of life and the incidents officers deal with stay with them forever. The drip-drip effect of responding to sorts of things most of us wouldn’t want to experience once, let alone daily, leaves its mark. Most officers I know have developed a tough shell and for some that hides many scars, both physical and psychological. After his session Jon was approached by members of the audience who wanted to thank him for sharing his experiences, to tell him how he had made them feel, how they shared his frustrations, or how he had reinforced that numbers can never tell the whole story. There were handshakes, hugs and a few more tears. This, for me, was the Power of Storytelling in action. The conference had a great line-up of academics and practitioners exploring what is a really interesting topic (I appreciate you’ll have to trust me on that), but what Jon’s story did was to lift their research off the page and into the real world. The numbers they referred to throughout the course of the event are of course real people. It took one person, speaking for less than an hour, to bring that focus. We really can’t afford for storytelling to become another buzzword, for its power to become diluted. We’re all under huge pressure to continually generate content to keep our websites and social media fresh and compelling and there is a risk that we sacrifice quality for quantity? So how about we tell fewer stories, but tell them better? To scale our content back might feel counterintuitive but the point of great storytelling is to cut through the content tsunami and produce something which really engages our audience. It’s resource-intensive to find the right person to tell the right story – and this can also lead to weaker stories slipping through – but as Jon’s example showed me, the impact of a great story well told can be phenomenal and have a lasting effect. *Thanks to Dan Anderson (@FourthStreetDan) for reminding me of some excellent buzzwords I hope we will see the back of soon (if they haven’t already shoved off).